The entire family will enjoy touring the beautiful waters of the Anclote River and the Gulf of Mexico. This is the trip you don’t want to miss on your visit to Tarpon Springs. We take you on an exciting narrated dolphin cruise down the beautiful waters of the Anclote River to the Gulf of Mexico. You’ll be looking for dolphins, manatees, birds, the Anclote lighthouse and other historical sites. Our beach excursion allows you to disembark on the Anclote Island to stroll the beach and look for shells. We offer snacks, margaritas, sangria, and soft drinks. To add to your comfort also have restrooms on-board. Check out this video for a taste of what you will see. Brand new beach Ramp – Safe & Easy! We’ve added a new ramp to the front of our boat to make it EASY and SAFE to get on and off the beach. Just stroll down our new ramp right onto the beach! We have the largest and safest sightseeing boat at the Sponge docks. Our large 45′ fiberglass catamaran rides high in the water providing the most comfortable ride and you won’t get all wet! We are located in the heart of the Tarpon Springs Sponge Docks. 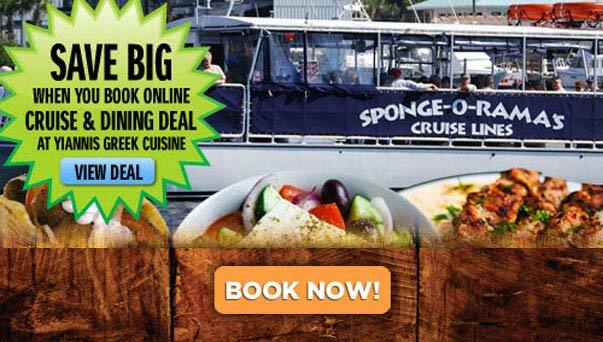 Spongeorama Cruise lines is the ONLY Tarpon Springs sightseeing cruise that allows you to park your car, take a beautiful and relaxing sightseeing cruise, enjoy two free attractions (our sponge diving movie and museum), and shop until your heart’s content. ALL AT THE SAME LOCATION! Tickets are available at Spongeorama Sponge Factory. Space is VERY limited, each cruise only boards 49 passengers. Book Online – We Sell Out Often!